Play dough fans rejoice! 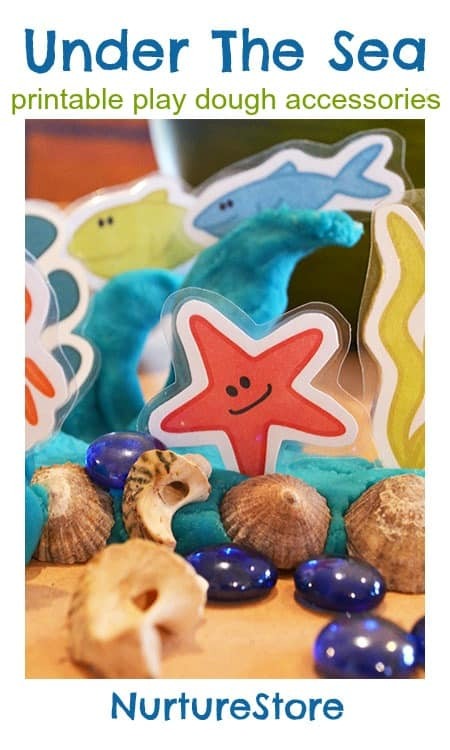 Kate from Picklebums is joining us today with a fantastic set of printable sea creatures that are perfect for enjoying with some ocean play dough. I’m delighted to feature a guest post idea today from Suzanne of skybluesea, inspired by The Rainbow Fish story by Marcus Pfister. 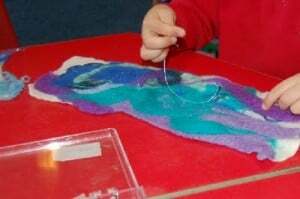 Suzanne is a freelance textile artist and she’s recently been working with a Reception and Year One class to produce an amazing collaborative work based on The Rainbow Fish book. The process incorporated art, design, texture, colour and numeracy. Here’s Suzanne to tell you more. extract from ‘The Rainbow Fish’ by Marcus Pfister . I have recently completed a project with a Reception and Year One class for Curious Minds. The brief was to include collaborative and individual working for the children, numeracy and the theme ‘water’. Mathematical language was used throughout : how many?, how many more?, Is that too much?, Do we need more or less? The children experienced silk-painting, and drawing outlines of shapes with gutta. We then talked about ‘The Rainbow Fish’ and we decided to create a huge silk painting based on it. They also made small wire and tissue fishes, and they had to choose two colours of beads for threading – counting as they threaded them on. Their fishes were then suspended from the ceiling with ribbons and displays of their silk painting, and lot of photographs of the children working. 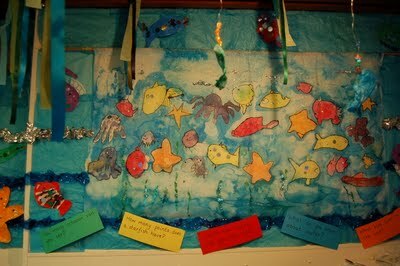 Questions like ‘How many points does a star fish have?’, ‘How many octopus can you see?’ also became part of the display. The children’s project also incorporated felt making, sewing and weaving. I love how they were able to try out lots of different techniques and make their own design choices as well as coming together to create a collaborative work of art the whole class took part in. You can see the finished result and find a tutorial for the felt making collage over at skybluesea – pop over and be inspired to try the ideas out with your children. Don’t Play with your Dinner! Games to get your toddler to eat. As all of you are probably painfully aware, it’s tough getting kids to eat and not always because they’re fussy. My daughter is great at eating but has the attention span of my boyfriend when discussing the shopping list! For this reason we have been forced to get creative at dinner time and, although it is sometimes painful always having to play games, it’s certainly less painful than the alternative which is negotiation, followed by yelling, followed by the naughty step. Following are the games we have devised to get our toddler to eat and if even a few of you out there can benefit from what I share then it’s a blog worth posting! 1. I hold up the five fingers on my hand and wiggle them about. Amelie then has to make them disappear one at a time by eating a mouthful of food. 2. I ask Amelie to eat something red and she eats a pepper. I ask her to eat something green and she eats a bean. She’s usually so busy working out the colours she forgets she’s eating at all. You can also do this with the alphabet i.e. eat something beginning with ‘g’. 3. I tell Amelie she’s going to be a magician and she has to make things ‘disappear’ from her plate (while I’m looking in the other direction). When I turn back I’m amazed that it has disappeared. When I pretend that it has turned up in my mouth she finds that hilarious. When I protest that I don’t want her to make any more broccoli appear in my mouth as I’m full she can’t wait to eat more to fill me up. 5. We make food into families i.e. if there are four pieces of carrot they are mum, dad, brother and sister. When she eats one, I ask her which one it was and who misses them the most. Whichever she indicates has to be eaten too so she can reunite them. If there is one left on the plate, they must be lonely so they also have to be eaten! 6. I also play the animal game with Amelie which is what does this animal eat? She then has to be that animal i.e. pretend to be a rabbit to eat carrot. When it comes to something like broccoli you have to bend the truth a little! We use a turtle for broccoli! If there is a particular food your child doesn’t like it might help if their favourite animal eats this food. 7. We also play a fun game where eating food provides visible results of regaining energy. For example, eating one piece of carrot gets your finger moving, eating two pieces gets the hand moving and eating everything gets the arm moving about all over the place. This can be a bit wild and messy but is ultimately enjoyable! 8. Have you ever played musical dinner? Everyone has to eat until the music goes off and then you have to hold a pose. While the music plays everyone has to eat in a circuitous manner i.e. one piece of meat, one piece of potato, one pea and so on..
Alli Price runs Motivating Mum – website and events for mums in business (or those wanting to start up). She is also a mum to Amelie, 3 ½ and Freya, 2 months. The V&A is running a World Beach Project with artist Sue Lawty. 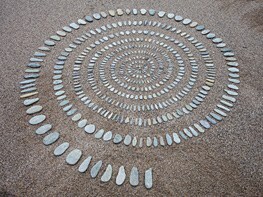 This is a project involving sculptures and pictures made from stones. Check out the V&A website for more info. Here is Sue Lawty’s project. 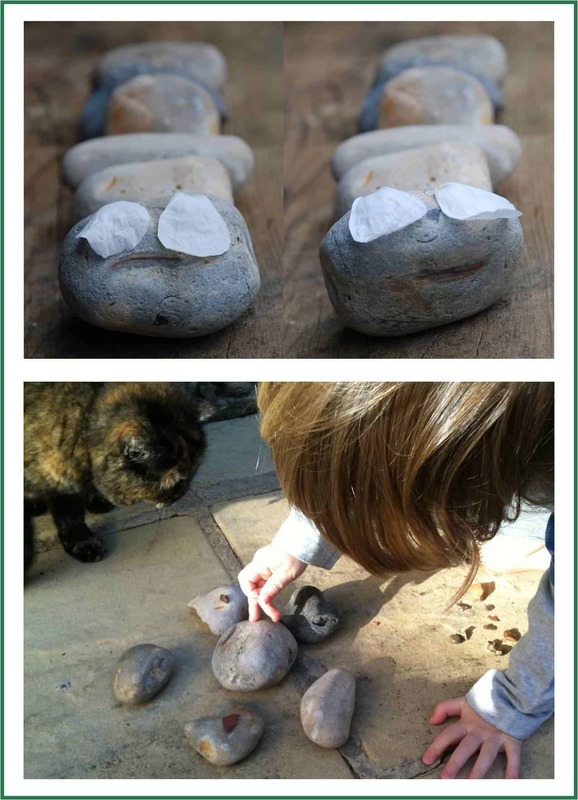 We couldn’t get to a beach, but still wanted to “take part”, so friends of ours brought us some Brighton Beach stones and we got Inspired by Nature at home… we have 6 BIG stones and lots of pebbles from the garden. 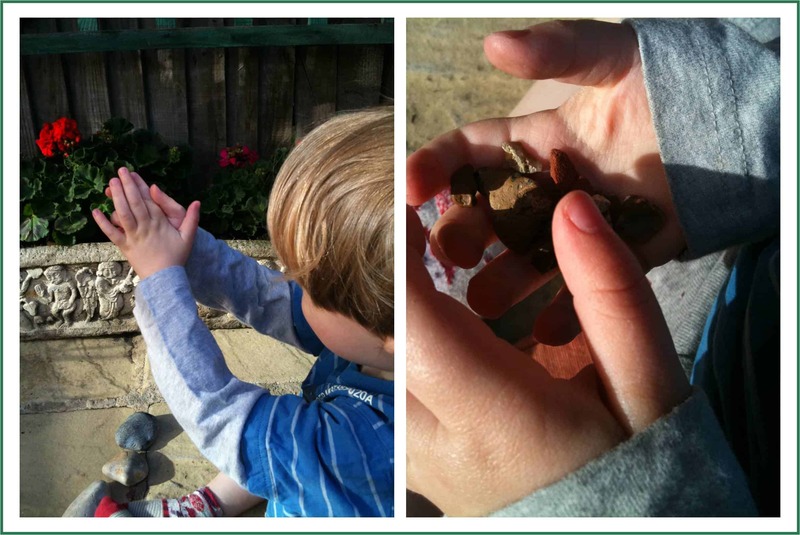 “Just Feeling” – enjoying nature and playing with the pebbles. They feel nice, don’t they?! Big & Little. Which is the biggest? Which is the smallest? Warm & Cold. He also pointed out to me, that after we had left the m in the garden overnight that they were cold (“Brrrrr, mummy, brrr”) and could I warm them up (beep beep beep – I am ashamed to admit, that that means the microwave). And finally! Some “artwork” and some playing (Red Ted did the flower pattern when I had turned my back). Happy & Sad! 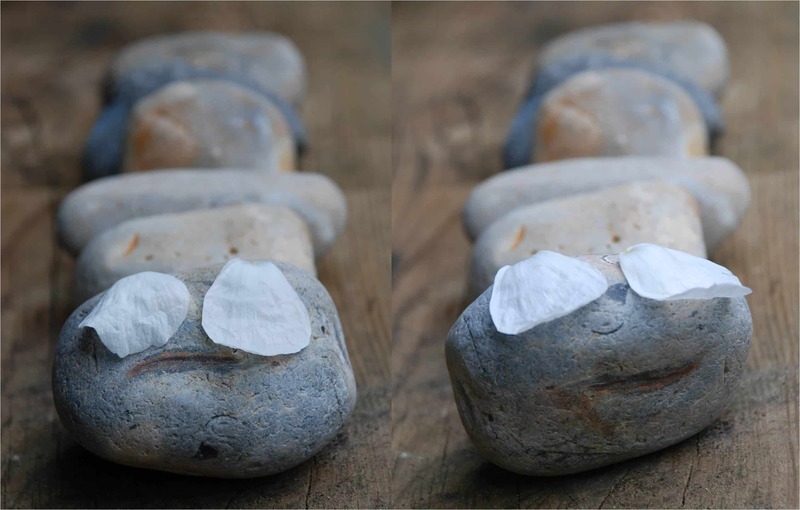 We made a stone caterpillar with petals for eyes. Turn the stone one way and he is sad (“hungry mummy”), turn the stone the other way and he is happy! 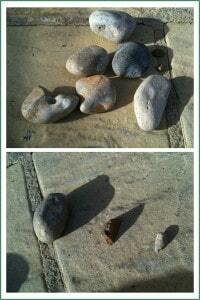 Hurray for Brighton Beach stone (and pebbles from the garden)! 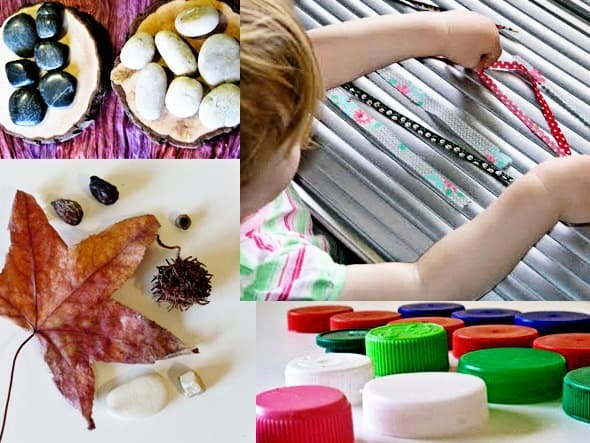 If you enjoyed this post, do pop over to Red Ted Art and see what we get up to on a regular basis – Get Inspired by Nature in Nature Get Crafty or just visit for Wednesday Crafts!! We look forward to meeting you! Hello everyone and welcome to Guest Post Day! Erica over at Littlemummy.com has been organising ‘blind dates’, linking up pairs of blogs to swap posts today. 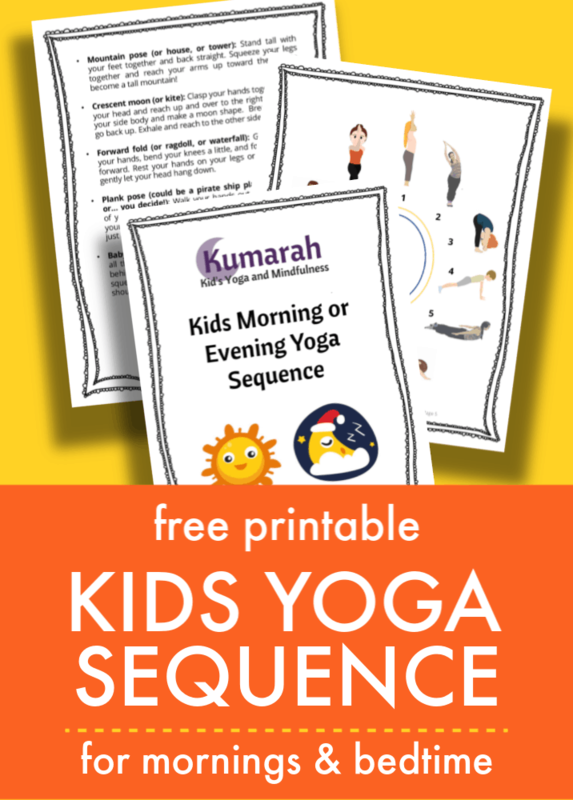 I am delighted to be paired up with Sandy from Baby Baby and to bring your her post, which even includes a story she has written just for us, which I hope you will enjoy reading with your children. (And please do pop over to Baby Baby to read the post I’ve written for her.) So, over to Sandy…. Hi, I’m Sandy. I write the blog Baby Baby. Baby Baby is my place to rant, rave, process my thoughts and attempt to entertain. One thing I don’t do is write about crafting. My two boys, Presley, 2 and Cash, 1, enjoy colouring at home and occasional sticking, but we tend to leave the messy stuff for Toddler Group. When I found I was swapping blogs with NurtureStore for the day I felt inadequate. What on earth could I write about? Cathy has written a wonderful post for me called A Reluctant Parent’s Guide to Kids’ Craft. Yep, that was definitely written for me! The name of this blog however, NurtureStore, inspired me. Here is my guest post. It’s never too early to encourage a life-long love of books in your children. One of my earliest memories is being read ‘Toby to the Rescue’ by my Mum. I was only two. Part way through the story the phone rang. Mum answered it and I carried on ‘reading’. I could remember every single word. Another treasured memory is of my Dad making up stories about a family of hedgehogs at bathtime, then my Mum would read stories and sing to us as she tucked us up in bed. I’ve always loved books and I still read every day, even if it’s just a couple of pages of a novel before I fall asleep. Newborn babies will love being read to. They will be comforted by the sound of your voice. As they develop and their eyes begin to focus, babies will enjoy looking at the pictures in board books. Soon they will reach out to touch the images. This is where textured books are brilliant. They may annoy mum and dad, but books with animal sounds will usually raise a smile from your little one. 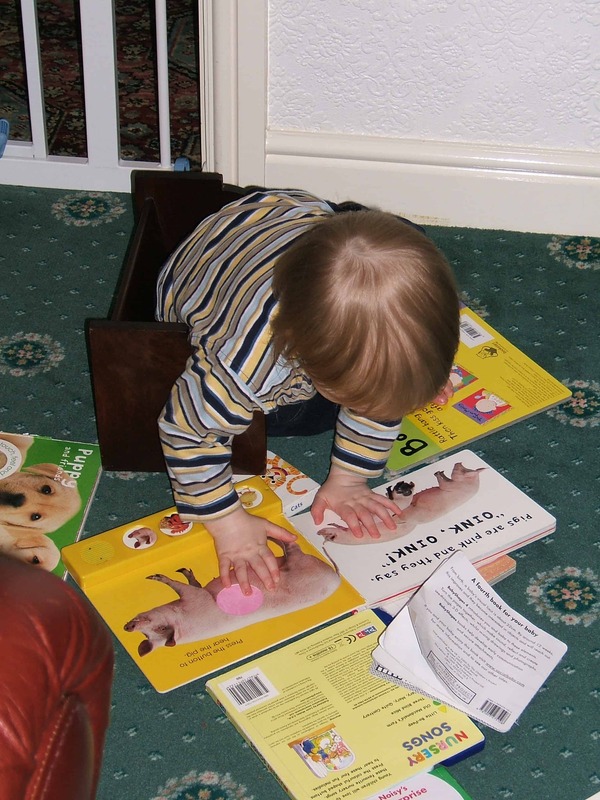 Encourage your baby to hold books. As they learn to turn the pages of a board book they are developing motor skills. Make books part of their everyday play, don’t just save them for bedtime. The bedtime story is a wonderful part of childhood. You can start your baby’s bedtime routine at any age, the younger the better. To begin with you may think they’re not listening, they will grab the book and try to eat it. Do persevere. This is a wonderful opportunity to bond with your child – for both parents. Soon your little one will be choosing books and you will accidentally on purpose rotate them so that you don’t have to read ‘The Hungry Caterpillar’ by Eric Carle for the thousandth time! Presley loves Julia Donaldson stories, particularly ‘Night Monkey, Day Monkey’ and, of course, ‘The Gruffalo’. 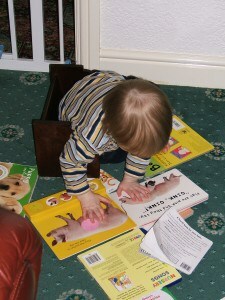 Cash’s current favourites are ‘Elmer’ by David McKee and the Panda and Gander stories by Joyce Dunbar and Helen Craig. Reading can be free, you just need to join a library. Our local library is tiny, but they have hundreds of children’s books. You can also ask for books as presents. One thing I’ve never done is write a children’s story. It’s always been something I’ve thought about, but didn’t have the inspiration – until now. This week I was sat with a toddler on each knee, looking at the garden. We saw squirrels, birds and bees. I started to tell my boys that bees made honey. They looked at me like I was making it up. So I made this up instead. Boris was a young bee. Boris was a busy buzzy young bee. He didn’t stop buzzing all day. Boris spent all day flying from flower to flower. He collected pollen from the flowers in little bags on his legs. When the bags were full he flew back to his hive. Boris lived in a hive with loads of other buzzy bees. The buzzy bees made delicious honey in the hive. One day Boris was buzzing around some beautiful yellow flowers. He had collected a lot of pollen and it was nearly time to go back to the hive. All of a sudden he heard Walter the wasp flying towards him. Walter was a naughty wasp who liked to cause trouble. Walter didn’t have an important job, like Boris. Boris was scared of wasps and Walter was a big wasp. Boris decided to fly home, but Walter chased him. Walter laughed as he chased Boris, but Boris was too quick for him. Boris buzzed away from Walter. When he could no longer hear Walter, Boris stopped buzzing and rested on an orange flower. Boris looked around. He didn’t know where he was. He hadn’t seen orange flowers before. Boris was lost! He didn’t know what to do. He had a little room in his bags so Boris collected some pollen from the orange flower. It was getting dark, but Boris didn’t know the way home. Then Boris heard buzzing and saw a big bee from his hive flying towards him. ‘There you are, Boris!’ said Billy, ‘I’ve been looking for you’. Boris was very happy to see Billy and followed him back to the hive. All the other buzzy bees were pleased to see Billy and Boris. Boris turned his pollen into honey and it tasted wonderful. After that all the buzzy bees from the hive collected pollen from orange flowers. Boris was a beaming busy buzzy bee who decided he was no longer scared of wasps. Thank you for having me, Cathy. Normal service will be resumed next time!